Amazon to Offer Free 1 year Prime membership for BSNL Landline Broadband and Postpaid plans. BSNL has partnered with Amazon to offer one year Amazon prime membership at no extra cost on select BSNL Landline Broadband plans and Mobile postpaid plans across the country on occasion of upcoming major festivals. High speed 4G technology provider BSNL starts Offering Free Amazon Prime subscription on selected Postpaid, Broadband Landline plans which is announced on account of its Foundation day i.e 1st October. To compete with major telecom companies Vodafone India and Bharati Airtel, BSNL moving strategically to grab more connections and customers to its network. In view private telecom's Vodafone India and Airtel already offering free Amazon prime subscription under postpaid mobile plans now the same BSNL followed the same. PSU by moving a head is offering not only to Postpaid users but also Landline Broadband plans customers with Free One year Amazon Prime memebership across India. 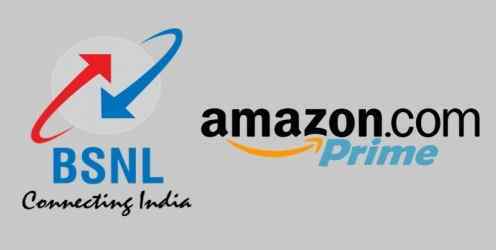 Giant Online shopping portal Amazon and BSNL have partnered together to offer one year of Amazon Prime (worth Rs.999 per year) to Rs.399 and above BSNL mobile postpaid plans or Rs.745 and abvoe BSNL Landline broadband customers at no additional cost. Prime Music: Ad-free music with unlimited offline downloads across tens of millions of songs. How to grab this Amazon deal? In the next screen, Login account with your Amazon user name and password or create a new Amazon account if you do not have an account on Amazon. Your Amazon Prime subscription is now activated for one year at no extra cost. The offer is not available for existing Prime members.